I am all out of instant cocoa. Carole gave me this for my birthday probably a couple years ago. You mix it into milk, as opposed to water. This yields a richer hot cocoa but it can be so easy to scald the milk which gives a slightly burnt taste to the cocoa. I finally, after more than a few errors, figured out that 2 minutes in my microwave produced a milk of sufficient warmth that it brought out the chocolate flavor just perfectly. I seem to be on the low end of the recommended Vitamin D charts anyway so why not make hot cocoa to get my D levels up? Like I need a reason to drink hot cocoa. I finished the container off last week. It was a sad day to toss it into the recycling bin. 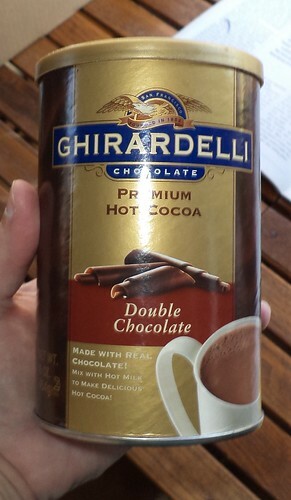 I looked at Mariano's on Saturday, but their selection of instant hot cocoa is very, very sad. I know I can make it the long way; warm milk and melted cocoa with a smidgeon of sugar, but that takes too long when you want cocoa NOW. I'll keep my eyes open in my travels. There is something out there I haven't discovered yet.